The average 2016 sales prices for most condominium floor plans are continuing to increase, though they are doing so at a much slower rate than in prior years. But not all condominiums have seen price increases this first quarter. Some condos are experiencing decreasing average sales prices and a few that have yet to see a sale this year. Our sales volumes are also down 10% compared to the 2015 January through April time period. It is important to note the current pricing levels we are seeing in many buildings. If you look at many of the condominium preconstruction prices, deduct the 20% down payment, deduct closing costs and ignore all of the upkeep costs, this is roughly the same price at which the majority of condos are selling. We can clearly see that many condos are selling at the same, or slightly increased, prices. Some are slightly below last years prices. 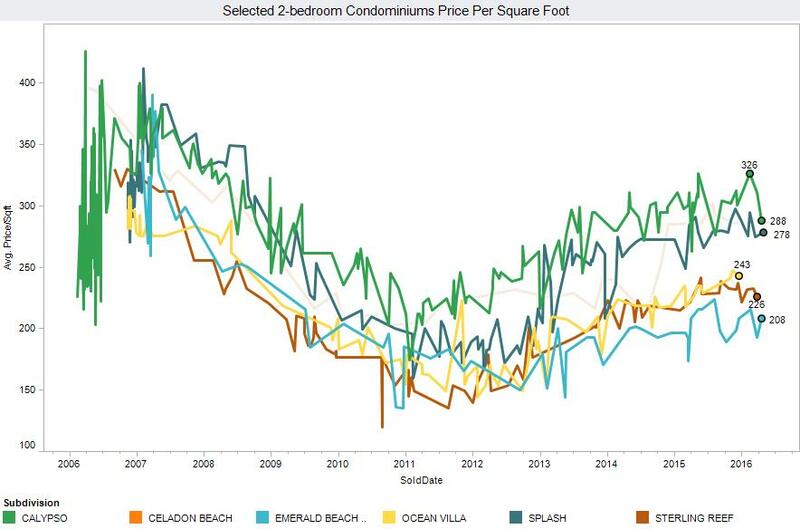 This graph also illustrates the disparity between the most popular and less popular condominiums. For example, Calypso is currently selling within the range of $288 to $326 per square foot, while Emerald Beach Resort is selling for only $208 per square foot. The stronger volumes of sales in certain condominiums can have a significant impact on the average price per square foot. 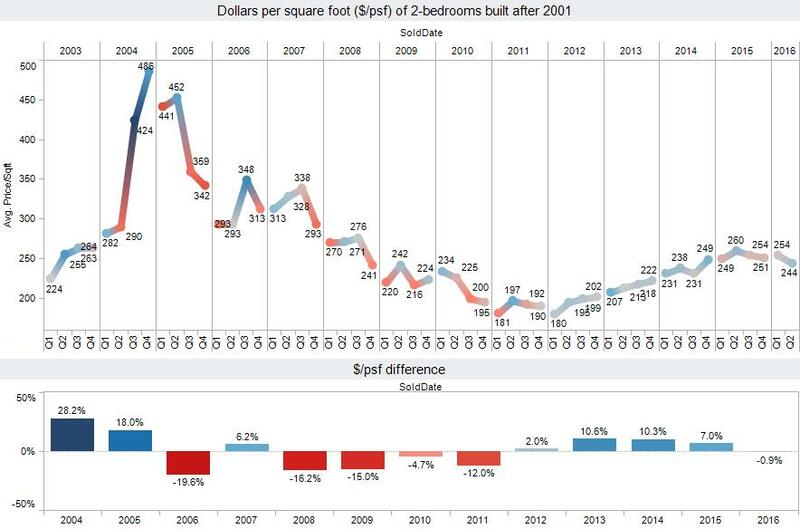 The graph displaying the average pricing of a two-bedroom condo unit built after 2001 is very telling. It shows that, on average, the units with a cheaper price per square foot are selling at a much higher rate than those with a premium price. Sales volumes for these condos are 6% behind last year's numbers, which can primarily be attributed to the inventory available as well as the type of sellers. This market has shifted from short sales and foreclosures to condos that will only be sold according to the seller's terms. The sellers mindset is very important. Today's sellers are not in financial distress. Most are the same sellers that bought preconstruction. They have held onto these properties through the entire financial crisis. They can afford to take their time. This no-compromise mindset and higher asking prices are causing the 6% absorption rate decrease from this same time frame last year. Created on 11 May 2016 . Last updated on 02 June 2016 .